Moutier, Switzerland: Federation Internationale de Gymnastique, 1996. Red cloth covers with gilt titles on spine, DJ. 9 1/4 x 12 inches. $60.00 postpaid via US Mail, media rate, insured, (USA only). *International shipping rates vary by country and region. Airmail via US mail with insurance would be approximately $30.00 to $40.00. [Official Poster, 1972 Munich Olympics]. 84.5 x 119 cm (33 x 47 inches). This poster is oversize - it was not sold to the public. This is the original advertising poster from the Munich Olympic Games. and were hung in train stations, airports, kiosks and other locations before and during the Olympic Games. The design shows a female gymnast doing a floor routine. *USA delivery is via US mail, Priority rate, insured. International delivery add $25 for delivery via US airmail, Priority rate with insurance. Posters are shipped rolled in a sturdy tube. Additonal poster purchases can be shipped in the same tube for free. So consider ordering more than one poster and ship them together. We stock many out-of-print titles on gymnastics dating from the 1700's. Libraries and collectors should send their want lists for our attention! the IISOH Library and Museum at their website...www.iisoh.org, -- all sales income and profits go to the IISOH. Suggested Retail price: $5.00. See the WHOLESALE SCHEDULE here. Buy in bulk and use them as a fund-raiser; sell at meets, tournaments and competitions. 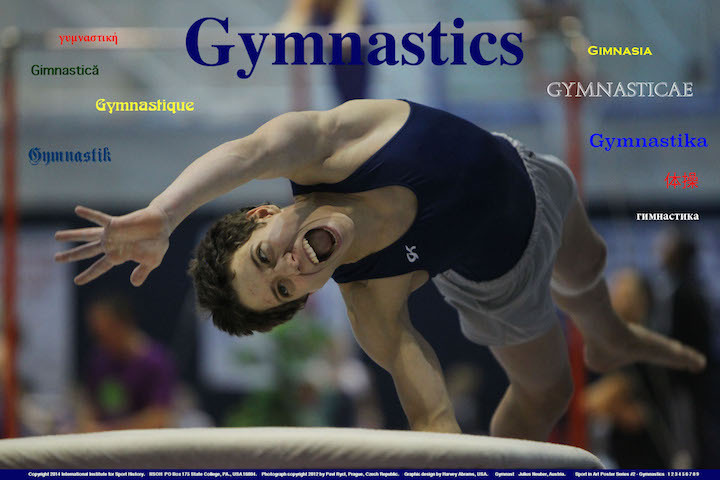 Use posters as incentives for the athletes - every gymnast should have one on their wall. Give them away as gifts to donors and sponsors. Credit cards - VISA - MASTERCARD & e-payments via MONEYGRAM. MONEYGRAM can be accessed online or in person at Walmart, CVS pharmacies and other locations. You may also use the Walmart payment system - it has lower fees, too. Pickup and pay in person. You may come to State College, Pennsylvania and pick up your purchase and pay cash in person. By appointment only. for the History of Sport, Physical Education, Recreation, Dance, Sport in Art and the Olympic Games. Copyright © 2016 Harvey Abrams. All rights reserved. No part of this text on any of these pages may be reproduced or transmitted in any form or by any means, electronic or mechanical, including photocopying, recording, or by any information storage or retrieval system, without the expressed written permission of the author. Or the wrath of Zeus will be upon you.